Patrick Hoban is no stranger to the Feature Match area, and he usually brings a spicy brew along with him. This time around, he is Dueling with a Monarch Deck utilizing Brilliant Fusion as well as super cool combos with Overdrive Teleporter to Summon Beatrice, Lady of the Eternal. 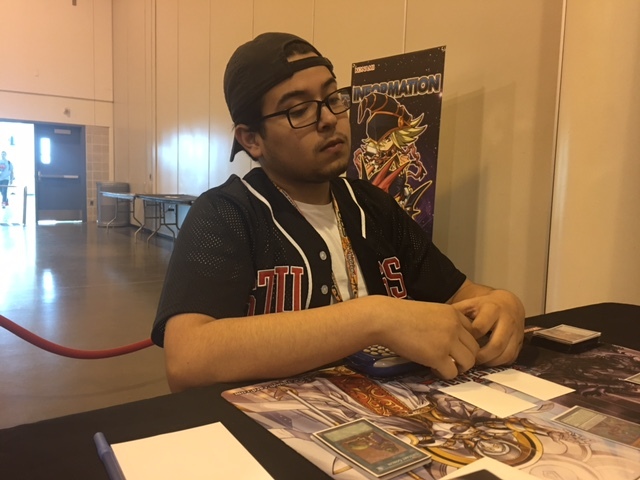 His opponent is Octavio Prado, another Duelist who has chosen to take the tried and true path this weekend by Dueling with Performapals. Can Hoban manage to defeat the Pendulum menace with his awesome Monarch Deck? Or will Prado showcase just why Performapals have had so much recent success? Prado won the roll and chose for Hoban to go first. Hoban began with a hand of Pantheism of the Monarchs, Ehther the Heavenly Monarch, Super Quantum Blue Layer, Brilliant Fusion, and Ghost Ogre & Snow Rabbit. He activated Brilliant Fusion and Special Summoned Gem-Knight Seraphinite by sending Gem-Knight Garnet along with Edea the Heavenly Squire. He used his additional Normal Summon on Super Quantum Blue Layer, and used its effect to add Super Quantum Red Layer to his hand. He tributed away both his Monsters for Ehther the Heavenly Monarch, but lost out to Prado’s Effect Veiler. He Set Pantheism of the Monarchs and ended his turn. Prado began with Draco Face-Off, choosing Vector Pendulum, the Dracoverlord and Luster Pendulum, the Dracoslayer. The Luster Pendulum, the Dracoslayer won the Flip and was put into the Pendulum Zone while Vector Pendulum, the Dracoverlord was sent to the Extra Deck. He placed Performapal Pendulum Sorcerer in his Pendulum Zone alongside the Luster Pendulum, the Dracoslayer and used the effect of the Dracoslayer to destroy Performapal Pendulum Sorcerer so he could add another copy. He put the new copy in his Pendulum Zone as well, then Pendulum Summoned Performapal Pendulum Sorcerer and Vector Pendulum, the Dracoverlord from his Extra Deck. The Performapal Pendulum Sorcerer triggered allowing Prado to destroy both of his Pendulum Scales to add Performapal Skullcrobat Joker and Performapal Guitartle to his hand. He Normal Summoned the Performapal Skullcrobat Joker and used it to add Performapal Monkeyboard. He activated Performapal Guitartle and then Performapal Lizardraw, which ultimately let him draw two cards once he destroyed Performapal Lizardraw. He used Mystical Space Typhoon next to blow away Hoban’s Set Pantheism of the Monarchs, then overlayed Performapal Skullcrobat Joker and Vector Pendulum, the Dracoverlord for Majester Paladin, the Ascending Dracoslayer. When the Majester Paladin, the Ascending Dracoslayer triggered on its Summon, Hoban responded with Ghost Ogre & Snow Rabbit to destroy it. Prado pressed on with Upstart Goblin, then Set two to his back row and ended his turn. During the End Phase he searched Archfiend Eccentrick thanks to Majester Paladin, the Ascending Dracoslayer. Hoban drew Return of the Monarchs for turn and fanned out his Graveyard so he could look through it. He banished Pantheism of the Monarchs and revealed three copies of The Monarchs Stormforth, one of which wound up in his hand. He moved to Battle Phase and declared an attack over Performapal Pendulum Sorcerer with Ehther the Heavenly Monarch. Once in Main Phase 2, he tried to activate Return of the Monarchs but Prado responded with his Set Draco Face-Off for Master Pendulum, the Dracoslayer and Vector Pendulum, the Dracoverlord. Master Pendulum, the Dracoslayer won the fight and was Special Summoned to the Field. Hoban tried to activate The Monarchs Stormforth, but Prado Flipped his Set Treacherous Trap Hole to destroy his own Master Pendulum, the Dracoslayer along with Hoban’s Ehther the Heavenly Monarch. With the writing on the wall and nothing in play, Hoban conceded knowing that Prado could Pendulum Summon for a huge Field next turn. A key Effect Veiler allows Prado to break Hoban’s hand to Set up a win. Can Hoban manage to win the next two Duels? Hoban chose to go first. Hoban opened with a hand of Brilliant Fusion, Edea the Heavenly Squire, Anti-Spell Fragrance, Pantheism of the Monarchs, and Mithra the Thunder Vassal. He Set Anti-Spell Fragrance and both of his spells before he ended his turn. Prado drew for turn and Hoban Flipped Anti-Spell Fragrance, but Prado had Draco Face-Off in response to give him a potential out. Vector Pendulum, the Dracoverlord and Luster Pendulum, the Dracoslayer fought and Vector Pendulum, the Dracoverlord hit the Field. Prado then Normal Summoned a second copy and swung in with both before he moved to Main Phase 2. 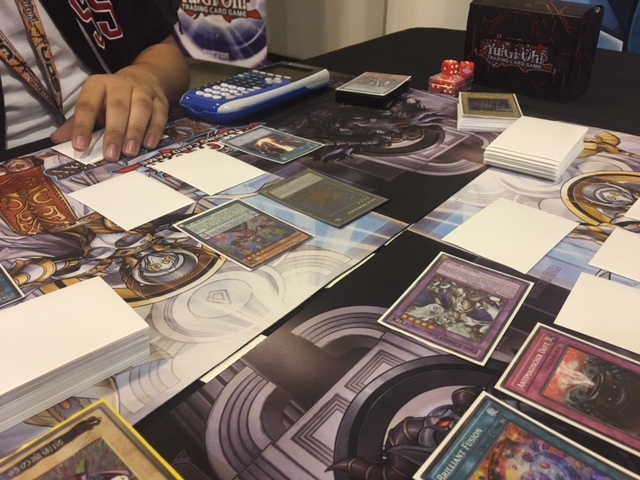 He overlayed the two copies of Abyss Dweller and Set two to his back row before he ended. Hoban drew Return of the Monarchs for turn and Prado activated the effect of Abyss Dweller during the Standby Phase. He Flipped his Set Pantheism of the Monarchs and ditched Return of the Monarchs to draw two copies of Anti-Spell Fragrance. With enough bricks to build a house, Hoban Set his Mithra the Thunder Vassal along with both copies of Anti-Spell Fragrance before he ended. Prado moved to Battle Phase and declared an attack with his Abyss Dweller over the Set Mithra the Thunder Vassal. He Set a third back row before he ended. Hoban drew The Monarchs Stormforth and during his Standby Phase, Prado activated his Abyss Dweller to make sure Hoban couldn’t use Pantheism of the Monarchs. He Set The Monarchs Stormforth and ended his turn. Prado drew and Normal Summoned Performapal Pendulum Sorcerer, then declared a direct attack with it alongside Abyss Dweller to leave Hoban with 1100 Life Points. Hoban drew Tenacity of the Monarchs and was finally free from Abyss Dweller. He began by banishing Pantheism of the Monarchs to reveal two copies of The Prime Monarch along with another Pantheism of the Monarchs; one of the traps was added to his hand. He then Flipped his Set Brilliant Fusion to send Edea the Heavenly Squire and Gem-Knight Garnet to the Graveyard in order to Fusion Summon Gem-Knight Seraphinite. The Edea the Heavenly Squire then triggered which let him add back a Pantheism of the Monarchs, then he Set Edea the Heavenly Squire and passed turn. Prado drew and Flipped Raigeki, prompting Hoban to extend the handshake. 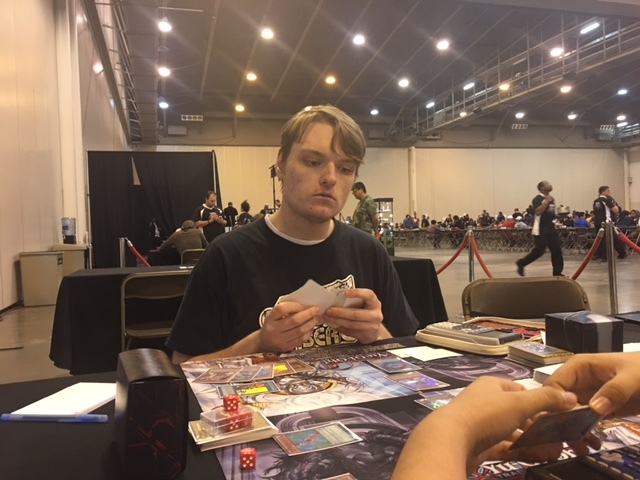 After a clutch Effect Veiler and battling through an Anti-Spell Fragrance, Octavio Prado manages to defeat Patrick Hoban and move on with a 4-0-1 record.